1) Network FailSafe device is controlled by which switch protocol? 2) Which NetWorker feature enables multiple storage nodes to use the same device? 3) What value has the address space been increased to with the introduction of IPv6? 4) What is a role of a NetWorker storage node? 5) Which protocol is used by open systems hosts to access storage in Fiber Channel SANs? sends a read request. What is the next step? The Channel Director checks the track table. 7) What are two CLARiioN High Availability features? 8) What do VLANs reduce? 9) What does EtherChannel link aggregation do? 10) What is used by NetWorker to manage its configuration? 11) In Asynchronous transmissions how are characters transmitted? 14) What generates the Content Address for a Centera? 15) Which level of backup is performed during a NetWorker consolidated backup? 16) In a NetWorker browsable recovery, what is true about the destination client? 17) In a NetWorker recovery, which client role performs the recovery? 18) What is Celerra Replicator? 19) What is the default subnet mask for an IPv4 Class B address? 21) How many octets in a default Class C IPv4 address make up the network portion? 22) Which NetWorker resource is used to determine the backup level for a client? 23) What is a characteristic of Centera? 24) What load balancing policies are available in PowerPath? 25) Which of the following Symmetrix connectivity options can you use with Open Systems and Windows Hosts? 26) Which of the following allows you to use ControlCenter Automated Resource Manager Storage Provisioning Services? 27) In Celerra TimeFinder/FS Far Copy how does replication happen? 28) In a Centera, what is a supported replication topology? 29) How many optical network ports are available on a NS500 DataMover? 30) What does the OSI Physical layer provide? 31) What is a function of the API for Centera? 32) What is true about FTP and TFTP ? 33) When is Celerra SRDF used? 34) How is free maintained in the CLARIION write cache? 35) Which symmetric presents devices to hosts? 36) What dose the control Center storage agent monitor? 37) When is the Port Bypass Card used on a Symmetrix DMX? 38) Which of the Celerra data replication options provides a point-in-time filesystem copy over IP? 39) What does ISL aggregation do? 40) What are features of Celerra Replicator? 41) Which protocol does open systems hosts use to access storage in Fibre Channel SANs? 42) Which NetWorker host performs the backup of the bootstrap save set? 43) Which product is used to create Logical Volumes on a Symmetrx system? 44) Which Symmetrix connectivity options can be used with mainframe hosts? consolldated alters and threshold charts? 46) Which set component is requires for write caching to be enable in a CLARIION array? 47) What is a benefit of using zoning in a SAN? 48) What is a characteristic of enterprise directors? 49) Which java based interface manages standalone MDS-Series switches? 50) Which protocol is used by open system hosts to access block level storage over IP? 51) What is a characteristic of a Content Address in Centera? 52) What is use of Internet Control Message Protocol ICMP? 53) What is the purpose of storage groups in a CLARiiON storage array? 1) What statement best describes TimeFinder/Mirror Clone? 2) Which of the views in ControlCenter Console displays Front EndDirectors, Disk Directors, and all the devices for a Symmetrix array? 3) Which is a feature of TimeFinder/Snap related to data accessibility after snap session is initiated? 4) What is the difference between theNSXXXG and the NSXXX? 5) Which views in the ControlCenter Console can be used to monitor the environment? 6) Which is monitored by the ControlCenter Host agent? 7) What is a benefit of SRDF/Automated Replication solution? 8) What is correct sequence for starting a ControlCenter component? 9) What is the purpose of a TimeFinder/Mirror reverse split operation? 10) After a client has presented information to be stored on Centera, what is the next step? 11) What is the purpose of Dynamic Mirror Service Policy for Symmetrix? It uses both M1 and M2 mirrors to fulfill read requests as quickly as possible. 12) Is routing same on all operating systems? 13) Is routing same on all UNIX OS? 14) Will all switches route multicast traffic by default ? No. Not all switches will route multicast traffic by default. 15) What command will you make use of to get details on routing table in windows or Linux systems? 16) What information is displayed on the Availability Tracking screen? The amount of planned downtime of a managed resource. 17) What causes the data source to report an unknown state? 18) How should you determine which ports to use for the AAM installation? 19) What tasks can occur on a secondary agent? 20) A system administrator is monitoring the AAM domain and notices that a Resource Group is in the unknown state. What does this state indicate? The agent on the node hosting the Resource group is in the failed state. 21) What is a key requirement of Content Addressed Storage? 22) What failover and failback does Celerra SRDF/A support? 23) What are Virtual DataMovers also called as VDMs ? 24) In a Centera, what is the minimum node configuration of Generation 4 Hardware? 25) Which statement about WINS is correct? enabling 1 bit subnetting, what would be the broadcast address on the first subnet? 28) Which statement about NetBIOS is correct? 29) What is an operation of the OSI Transport layer? 30) Which statement about Network backup is correct? 31) Which port is the default port used by HTTP Web Browsers? 32) What is a function of NetWorker? 33) Which statement about Layer 3 devices is correct? 34) Which Centera GUI tool is used to configure site specific information? 35) In Network backup are permissions on NFS and CIFS files simultaneously preserved? 36) What is a NetWorker remote device? 37) What are features of a NetWorker storage node? 38) In a Centera, what is an Access Profile? 39) What is a characteristic of Centera? 40) What is the Address Resolution Protocol responsible for resolving in Direct Routing? 41) Which statement about Synchronous transmissions is correct? 42) What is the Address Resolution Protocol responsible for resolving in Indirect Routing? 43) What is a function of NetWorker? 44) With IP version four IPv4 addresses, how many octets make up the address? 45) With IPv6, what is the size of the address space? 46) What is the maximum number of DataMovers supported in the NS5XX range of equipment? 47) For what purpose are Class D IPv4 addresses used? 50) What is the purpose of the TimeFinder/SRDF QoS Task Bar in ControlCenter? 51) Which of the following is the last step of retrieving an object in the Centera environment? 52) How many octets in a default Class B IPv4 address make up the network portion? 53) What is the maximum number of Blades supported in the NSX range of equipment? 54) How many optical network ports are available on a NSX Blade? 55) What does SNMP normally use? execute. Which two configuration options must be modified to allow this operation in a veritas netbackup environment? 2) Which NetBackup process is responsible for volume recognition on a media server? 3) What options can be used to expire physical media in a veritas netbackup environment? 4) Which command can unfreeze a tape with the media 10 of ABC123 in netbackup? 5) What is required for a SSO to work in netbackup environment? 6) Which netbackup commands can be used to check and update the volume configuration? tapes out of the Full volume pool, not the DailyVolume pool. What can be done to have the Incremental schedule use the PoolA volume pool? 8) Which veritas netbackup command can be used to bring a down drive to an UP state? 9) Which factors can determine the number of data streams that can run concurrently? 10) Which methods automate notification about the status of all backups in veritas netbackup environment? 11) What is the appropriate sequence of steps needed to properly implement the VxVM Snapshot Method? 12) What is the use of commands vmcheck, bpupdate, vmcheckxxx ? 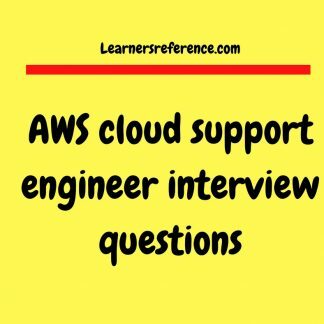 13) To restore data that was backed up to a NearStore VTL and then off to tape do you need to restore from tape to the NearStore VTL before restoring the data to the server? 15) What is the largest unit that you can backup with SnapVault? changes back to the OSSV primary. How can this be done? 17) A customer wants to use SnapVault to backup snapshots from a traditional volume. Which one of the following will impact SnapVault performance? 20) A customer has an Oracle Database with a RTO of 1 hour, but a RPO of 5 minutes. How can they achieve this with minimal WAN traffic? 21) How can you make a SnapVault destination volume read-write? 22) Can the NearStore VTL can be added to an existing Fibre Channel Fabric without removing the Tape device? 24) can the customer backup that data not in the qtrees? 25) A customer has a volume on a filer that contains 10 qtrees. All but one of the qtrees have similar change rates and size. The volume is scheduled to transfer every morning at 1 AM. The 9 qtrees with similar characteristics all transfer within 15 minutes and the tenth qtree takes two hours to complete. When will the SnapVault transfer be completed for those qtrees? 26) Customer wants to run 40 OSSV relationships concurrently. Which system can support this as a destination with the Near store personality? 27) What is the minimum RPO available using SnapVault schedules? 28) Can SnapVault can replicate data over Fibre Channel between the primary and secondary storage systems? 29) How can we tune a NearStore VTL system? Nothing, the system is auto-tuning. 30) What would you use to get a centralized view or SnapVault backups in a NetApp FAS environment? 31) What is required to ensure that a DataFort configuration is ready for disaster recovery? 32) When are Recovery Cards required in the trustee key-sharing process? Disk and tape I/O cannot be combined through the same standalone DataFort. Disk and tape I/O cannot be combined through the same cluster. 34) How many additional FC-switch ports are required for an inline direct-attached FC-5XX DataFort? 35) If your recovery schema is two out of five, how many Recovery Cards do you need to remove a cluster member? The cluster continually aborts and reforms. The DataFort techdump takes a very long time to complete. 37) In SAN , you are restoring a deleted Cryptainer that was created in SAN . How can you find the keyID for the encrypted LUN? 38) What is the purpose of the Key Policy setting for tapes? will have on an existing environment? 40) If your disk array will support 150 MB/s, approximately how long will it take you to complete the Encrypt Empty Disk Task on 100TB of disk space? administrators from gaining Cryptainer access by adding themselves to which one? One Cryptainer is created per LUN. 43) Which SCSI signaling and connector type is used by an S-Series DataFort? 44) Which defense setting requires zeroization after rebooting with a low battery condition? 45) Which step is automatically performed when using host virtualization? 46) Which filtering options does the network capture capability on the DataFort allow? 47) What can the E-Series DataFort net util tcpdump command capture? 48) Which actions remove key material? 49) Which settings do you use to enable the tape error recovery extension to the FC protocol? 50) What can be used to share key material between different DataFort clusters? All DataFort logs can be configured to be sent to a remote Windows-based server. DataFort log storage locations can be configured from the GUI or the CLI. DataFort logging can be configured to be sent to a remote syslog server. 52) Which FIPS certification does the FC520 have? 53) Which two upgrades produce a zeroization of DataFort? 54) How can we verify a customer disaster recovery configuration ? 55) Which methods allow movement of keys to two standalone LKM servers/appliances? 56) How do you ensure that operation trace logging is enabled? 57) What happens when the DataFort detects an intrusion? The DataFort stops encrypting and decrypting data. 58) When should you use DataFort cloning as a key-sharing best practice? 59) Which Solaris-specific file is used for target discovery for tape devices? 60) Which two FC DataFort deployment options are supported? 61) In FC-Series 2.x, which two applications recognize application pool labels? 62) Which are the backup types that are available in Netbackup? 63) What is media multiplexing? 64) What is avrd ? 66) What is a frozen image ? 67) What is retention period ? The length of time that NetBackup keeps backup and archive images. The retention period is specified on the schedule. 68) What is tape spanning ? 70) What is the full form of DLT? 71) What is image expiration and volume expiration? 72) What is Commandline to shutdown netbackup services on Windows Server? 73) Which command is used to produce a report on Status of Netbackup Images? 74) What is the use of command vmupdate? 75) Commandline for Creating a copy of backups created by NetBackup? 76) If you wanted to bypass netbackup commands and move a tape from slot 1 to drive 3 how would you do that? 77) If I asked you to tell me if a client has Netbackup on it just by using a telnet command what would you do? 78) If you wanted to know what IP address netbackup was using to perform backups what command would you run and where would you run it? 79) If a media ID A04567 comes back and it is frozen, what are the steps to unfreeze it and move it back to scratch from the command line? 80) What is the client version supported by NBU 6.x and 5.x masters? 81) What is the process of importing images and why do we import images? 82) There are 1000 Client machines , 999 machines are transferring datas in good speed but one client machine is taking too long to transfer a datas .That is backup should complete within 2 hours but after 12 hours and more the data transfer is still happening why? Please check the Network bandwidth. BPTM,bpbrm on both master and media server and bpbkar and bpcd logs on clients. I am appreciated if any one give more information on this. 83) There is a Tape library with 10 drives.Can we able to create 2 Storage units? As per my knowledge. N no. of storage units you can create. But mail criteria to create a storage unit is. 1) What information is displayed on the Availability Tracking screen? 2) What causes the data source to report an unknown state? 3) How should you determine which ports to use for the AAM installation? 4) Which two tasks can occur on a secondary agent in EMC environment? 5) A system administrator is monitoring the AAM domain and notices that a Resource Group is in the unknown state. What does this state indicate? 6) Where is the initial microcode program load file – IMPL.bin – stored in Symmetrix? 7) How are disks accessed by UNIX hosts? 8) What are iSCSI naming conventions? 9) How does TimeFinder/Snap save disk space while providing full access to theoriginal data on the snapshot copy? 10) What is the difference between theNSXXXG and the NSXXX? 11) Which is monitored by the ControlCenter Host agent? 12) What is the benefit of SRDF/Automated Replication solution ? 13) What is the purpose of a TimeFinder/Mirror reverse split operation? 14) What is the correct sequence for starting a ControlCenter component? 15) After a client has presented information to be stored on Centera, what is the next step? 16) What is the purpose of Dynamic Mirror Service Policy for Symmetrix? 17) Which views in the ControlCenter Console can be used to monitor the environment? 18) What is a feature of both TimeFinder/Mirror and TimeFinder/Mirror Clone? 19) How many octets in a default Class B IPv4 address make up the network portion? 20) What is the maximum number of Blades supported in the NSX range of equipment? 21) How many optical network ports are available on a NSX Blade? 22) learnersreference.com has a primary CX600 array and a secondary CX400 array. learnersreference.com wants to do data backup on the secondary site while the applications are still running on the primary site. How can bellbang.com accomplish this goal? 23) Which best describes a Fan-out Ratio for a SAN attached array? 24) Which web interfaces can be used to manage standalone M-Series switches? 25) Which components are required in order to enable write caching in a CLARiiON array? 26) Which is not a CLARiiON High Availability feature? 27) What are Celerra Replicator features? 28) Which types of disk drives are currently used on CLARiiON CX series storage systems? 29) What is the function of the Control Center infrastructure? 30) What are characteristics of cache memory on a CLARiiON array? 31) In a Symmetrix, what is Parity RAID? 32) Which protocol uses TCP/IP to tunnel Fibre Channel frames? 33) Which network based backup solution maintains both NFS and CIFS attributes? 34) Which types of disk drives are currently used on CLARiiON CX series storage systems? 35) What are features of Celerra Replicator? 36) What is the function of the Control Center infrastructure? 37) What are characteristics of cache memory on a CLARiiON array? 38) Which protocol uses TCP/IP to tunnel Fibre Channel frames? 39) Which network based backup solution maintains both NFS and CIFS attributes? 40) Which product is used to create Logical Volumes on a Symmetrx system? 41) Which Symmetrix connectivity options can be used with mainframe hosts? 42) Which control center view provides a single graphical view of the whole environment, including consolldated alters and threshold charts? 43) What is a benefit of using zoning in a SAN? 44) What is a characteristic of enterprise directors? 45) Which protocol is used by open system hosts to access block level storage over IP? 46) How is free maintained in the CLARIION write cache? 47) Which symmetric presents devices to hosts? 48) In a Centera, what is an Access Profile? 49) What is a characteristic of Centera? 50) What is the Address Resolution Protocol responsible for resolving in Direct Routing? 51) How are characters transmitted in Synchronous transmissions ? 52) What is the Address Resolution Protocol responsible for resolving in Indirect Routing? 53) What is a function of NetWorker? 54) What are features of a NetWorker storage node? 55) With IP version four (IPv4) addresses, how many octets make up the address? 56) With IPv6, what is the size of the address space? 57) How is metadata passed in NDMP2D backup ? 58) A Windows client must perform which operation to access a NAS advertised connection point? 59) A Windows client must perform which operation to access a NAS advertised connectionpoint? 60) What is the final step when retrieving an object in the Centera environment? 61) What is the first step or event when storing an object in a Centera environment? 62) What is a characteristic of a Content Address in a Centera? 63) What do VLANs reduce? 64) What is a characteristic of Centera fixed content? 65) How does NetBIOS handle name resolution? 66) What is the second step or event when storing an object in a Centera environment? 67) What best describes the TimeFinder Full Establish operation between a Standard and BCV device pair? 68) What is the purpose of Dynamic Mirror Service Policy for Symmetrix? 69) What are the data types supported in NAS? 70) Which views in ControlCenter Console displays Front End Directors, Disk Directors, and all the devices for a Symmetrix array? 71) What is the purpose of the Masking ControlCenter Task Bar in ControlCenter? 72) Which NetWorker servers can NetWorker Management Console manage? 73) What does the OSI Data Link layer provide? 74) What tool is used by service personnel to troubleshoot the Centera? 75) Is AVM used by default when creating volumes with the GUI? 77) What is a feature of SnapView Clones? 78) In a CLARRiiON array, a read cache operation begins when host requests data. What is the next step in the process? 79) Which access method id used for file sharing over an IP network? 80) Which is a valid Fibre Channel Topology? 81) A read cache miss operation on a Symmetrix has several steps. The first step is that the hostsends a read request. What is the next step? 82) At what percentage of cache capacity does high water mark cache flushing initiate in a CLARiiONsystem at the default setting? 83) In a CLARRiiON array, a read cache operation begins when host requests data. What is the nextstep in the process? 84) In ControlCenter, what does the Masking ControlCenter Task Bar do? 85) What determines the order data is flushed from Symmetrix Global Cache Memory? 86) Which two types of storage connectivity are associated with block level data? 87) Which protocol is used by open systems hosts to access block level storage over IP? 88) What is a characteristic of file level host storage access? 89) Which Symmetrix connectivity options can be used with Open Systems and Windows Hosts? 90) What are characteristics of a Content Address in a Centera? 91) Which Symmetrix system uses a two bus architecture that consists of an “X” nad a “Y” bus? 92) What is a characteristic of Connectrix enterpise directors? 93) Which load balancing policy available in PowerPath relates to path failover only? 94) What is Windows NT security account manager? 96) In a Symmetrix, what is Dynamic Sparing? 97) How does TimeFinder/Snap save disk space while providing full access to the original data on the snapshot copy? 98) Can NAS clients access data that are physically separate? 99) Give name of network topology popularly adopted in storage infrastructure? 100) Which is a feature of both TimeFinder/Mirror andTimeFinder/Mirror Clone? 1) What is PACS? What does PACS stand for? 2) What are the basic job duties of a PACS Administrator? 3) What is DICOM? What is the importance of DICOM in PACS profession? 1) What is Service Oriented architecture (SOA)? Service Oriented Architecture is a style of software design where services are provided by application components through a communication protocol over a network. 2) What are the different SOAP WSDL bindings? 3) What are the capabilities of SOAP UI Tool? 4) What do ‘200 OK’ response code in SOAP response indicate? ‘200 OK’ Response code in SOAP response indicates the SOAP request was processed successfully by the service provider and a response was generated to the service requester successfully. 5) What do ‘405 Method Not Allowed’ response code in SOAP response indicate? 6) What do ‘415 Unsupported Media Type’ response code in SOAP response indicate? ‘415 Unsupported Media Type’ in SOAP response to sender indicates the content type header with a value of text/xml was not sent by the sender to the service provider. 7) What are the building blocks of Service Oriented Architecture (SOA)? 8) What are Web Services? 9) What are the commonly used web services frameworks?. 10) What are the advantages of SOAP? 11) What are the fault message elements in SOAP? 12) What are the different areas where web services testing is used? 13) What are the different types of Message Exchanging Patterns in SOAP? 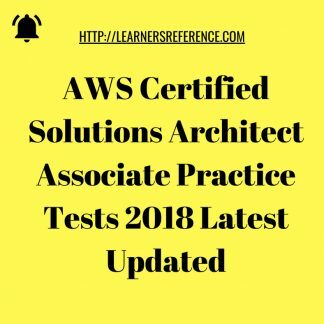 14) What are the common errors that you have when doing web services testing which is not related to actual request/response testing but more of issues you face during the initial setup to do web services testing? 15) What are the best general practices from a SOAP UI tester to take before starting web services testing? 16) What do ‘202 Accepted’ response code in SOAP response indicate? ‘202 Accepted’ Response code in SOAP response indicates the SOAP request was processed successfully by the service provider and there won’t be any response from the service provider to the service requester. Web Services Description Language provides a formal definition of the web services through abstract and concrete definition of an interface. 19) What are the components of WSDL? is an abstract set of endpoints supported by one or moer operations whereas describes how the operations are invoked by specifying protocol and data format specifications for the operations and messages for each port type. 21) What is the default encoding used in SOAP request and how it can be changed? 22) How would you know if the web services have been deployed or not? The above URL will give you the list of web services available for your reference. Note: You can replace the localhost with the IP address information if the deployment is in a virtual machine. 23) Ho would you find out the WSDL of a particular web service? 24) What do ‘400 Bad Request’ response code in SOAP response indicate? ‘400 Bad Request’ Response code in SOAP response from service provider to sender indicates either the HTTP or the XML request was not well formed and does not conform to schema. 25) What do ‘500 Internal Server Error’ response code in SOAP response indicate? ‘500 Internal Server Error’ Response code in SOAP indicates the request from the sender has created a fault message from the service provider to the sender. 26) What are the disadvantages of SOAP? 27) What is REST API? 28) What do ‘404 Not Found’ response code in SOAP response indicate? 30) What is a Service? Simple Object Access Protocol (SOAP) is considered foremost messaging standard for use with web services. SOAP is a lightweight protocol for exchanging information in a de-centralized distributed environment. It is a XML Based protocol. 32) What is the message format of a SOAP message? 33) What are the many different communication channels available for web service? 35) What is the different dispatching style of Mock Operation? 36) How testers can test early using web services when the code is being developed? 37) What are the benefits of using mock services for testing web services applications? 38) What language is used by SOAP and REST? 40) What is stateless communication? 41) What are the key to REST web services? 46) What is Service chaining? Enterprise Service Bus (ESB) is an architecture with a set of rules and principles integrating numerous applications together over a bus like infrastructure. ESB helps to decouple different disparate system by having a common communication across the bus without the need to know the functionality of the different systems. 49) What is code first web services development approach? 50) Which development approach is better – Code First or Contract First development approach and why? 51) What are the types of SOAP web services development approaches? 52) What is contract first web services development approach? Where does your spouse work? What is your spouses qualification? Why did you marry someone residing outside your home country? How much does your spouse make? Do you plan to pursue higher education? Do you plan to do a job? 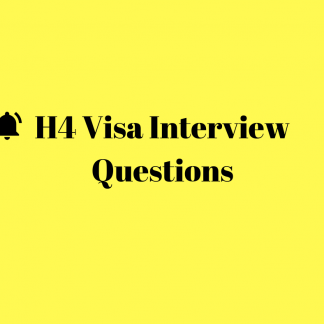 When was your last visa H-4/H1B/L1/B1 rejected? 2) Why do businesses make use of wordpress? 3) What is digital media marketing? Called by various terms like online marketing, online media marketing the digital media marketing in plain simple terms, is marketing your business online. 4) How will you start your digital media marketing? Now-a-days this information may not be sufficient unless otherwise you are an established brand. To market your brand online digital media marketing is an essential tool that can’t be overlooked. 5) What marketing strategies are essential components of digital media marketing? 6) Where does wordpress fit in digital media marketing of an enterprise? All this is possible at one click of mouse. 7) Is wordpress helpful in building search engine optimization (SEO) friendly websites? 8) Your business wants to know how does choosing wordpress as CMS help them improve their business performance? Can you justify your decision ? 9) Which command is used to get to know the number of posts in each category? 10) How will you update content of posts in bulk in your wordpress website? 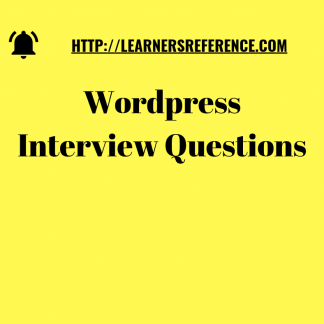 11) What is the significance of bulk post deletion in a wordpress database? Why do you need that? 12) How will you check valid users to stop spam users in your website? Why do you choose wordpress for creating your website? 1) Is oracle user password encrypted by default? Oracle user passwords aren’t encrypted by default.This is a security threat.Setting one parameter in the client side and one parameter in the server side we can ensure that Oracle always encrypts a password when it send it across a network. 2) Which oracle database user can make use of datapump utility? 3) What is needed for a user to perform advanced datapump tasks in an oracle database? 4) Is oracle database recovery manual or automated while making use of RMAN? 5) When are traditional point-in-time recovery techniques used? What was the disadvantage of this procedure? 6) What are the steps involved in configuring flashback database? 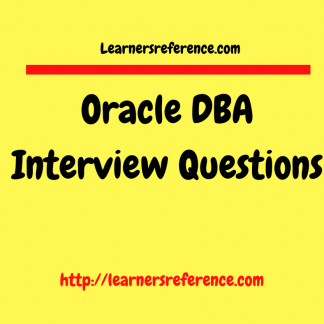 8) What privilege is needed to access DB console web application in an oracle database? DB Console is the free web based application shipped for free since Oracle database 10g. From Oracle 11g onwards database db console web application is shipped for free. 9) What is automatic shared memory management? How is this achieved? 10) What does a Flashback Versions Query do in an Oracle database? 11) What are many different types of recovery processes in an oracle database environment? 12) You have scheduled an RMAN backup. It fails before completion. Do you need to start this from beginning? 13) When does the error ORA-00903: invalid table name occur? How will you fix it? Oracle object names are case sensitive. If we try creating a table with name specified in single quotes it throws this error. 15) What is the use of oradim utility? Is there a Linux equivalent of oradim utility? 16) How does an undo tablespace size correspond to flashback database feature if one has been implemented? 17) How is sizing of individual undo segments done? 18) What is the use of Undo advisor present in OEM? 19) Can you get details on database version as a normal user without SYSDBA privilege? It is possible to identify the version of the oracle database instance when we are connected as normal user and SYS user with SYSDBA privilege. Here is a simple demonstration. Initially I’ve connected as SYS user with SYSDBA privilege. 20) How do I determine if a tablespace is unavailable (or) Dropped? 21) What is advantage Of Using Direct-Path Loading Method Over Conventional Data Load? Conventional loading method used SQL INSERT statement to insert data into the tables one bind array size at a time.The direct-path loading option doesn’t use the SQL INSERT statement to put data into tables. It formats the Oracle datablocks and writes them directly to the database files. 22) What is the user-managed recovery procedure to recover control file in an oracle database? Data Pump doesn’t actually execute the statements but write the DDL statements to the file specified by the SQLFILE parameter. 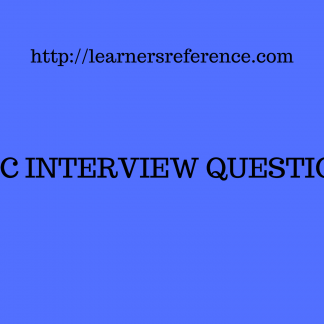 24) How to perform log sequence based incomplete recovery? 25) How to move controlfiles across disks? Moving Control Files across disks happens when the company’s high availability policy demands the control files to be placed in different disks.Follow the steps to move the control files. SQL>show parameter control_files; – list showing control file location. SQL>alter system set control_files=new-file; rename the parameter in parameter files. 26) Is table automatically analyzed upon index creation? Database statistics play a crucial role in determining the performance of the database. Oracle database has many inbuilt tool that will let us analyze the database objects. The most important database object used to store information is the table. An index is based on one or more column of a table. Whenever a table is created it is not ANALYZED. When an index is created it is automatically ANALYZED. Query the dba_tables data dictionary view to make sure that no rows have been analyzed upon table creation. We’ll insert few rows into the table and see if it is analyzed. We see that no rows have been analyzed upon insertion into the table.Now lets look at how an index is created and its rows are automatically analyzed upon creation. 27) How will you resize a tablespace in an Oracle environment? 28) What Happens When An Oracle Transaction Is Committed? The log writer writes the redo log information for the transaction from the redo log buffer to the redo log files on the disk, along with the transaction’s SCN. 29) What to do while Access is denied error happens during creating multiple copies of controlfile for multiplexing control files? 30) What is the use of v$flashback_database_log view and how this is associated with DB_RECOVERY_FILE_DEST_SIZE initialization parameter? The important initialization parameter to be initialized while configuring flashback database in oracle database is DB_RECOVERY_FILE_DEST_SIZE. After setting the value it is possible to verify it using show parameter command. Also v$views such as v$flashback_database_log, v$parameter can be used to obtain details about this initialization parameter. 31) What is database troubleshooting? 32) How can you get details of undo tablespaces? 33) What is the use of undo_tablespace initialization parameter? 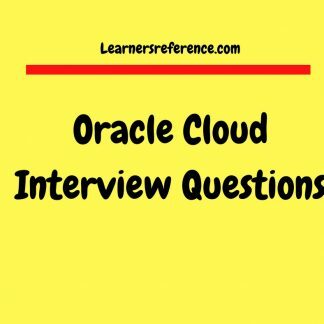 34) What is an oracle instance formed of? 35) From where can you get details about an oracle instance? 36) How to get details about SGA and PGA in an oracle instance? Determine the current size, minimum size, maximum size of SGA. Components of SGA can be dynamically resized. 3) Next major component is Program Global Area(PGA). 37) What is the significance of COMMIT_WRITE Initialization Parameter? 38) How will you format the sqlplus output? When we query certain tables, views and such database objects, we get the output in an unformatted fashion. In Oracle it is possible to format the sql output. We can format the column to be displayed. We can set size of columns. Here are the set of commands to format the output. We can format the column values and set it accordingly. 39) What is the advantage of compressing a backup? What is the advantage of ZLIB over bzip2? 40) What is new in oracle compression? 41) How do you enable compression? 42) What is the command used for enabling compression in versions prior to Oracle database? 43) How do you set the compression algorithm to be used in Oracle database? 44) What is need to compress data in oracle database and how is this being done? 45) You are getting error ORA-00054: resource busy and acquire with NOWAIT specified or timeout expired. 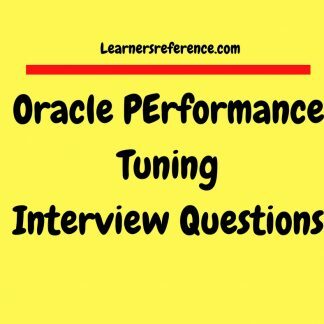 How will you fix this issue using oracle initialization parameter? Oracle database has an interesting initialization parameter DDL_LOCK_TIMEOUT set at session level and system level. Whenever a DDL statement like ALTER is issued against a table a DDL lock is acquired in that object. If we try to perform any operation against that object, it results in an error. It is possible to set the values at the database level. 46) ITIL SLA(Service Level Agreement) demands recovery of most systems to be done in minutes. What is the best way to achieve this in an Oracle database environment? 47) What is an initialization parameter file? What is its significance in an oracle database environment? Install oracle client software at client machines.Download client software from oracle website. 49) Can you create a database tablename with spaces in them? Is it possible to perform DML operations against this table? This produced the correct result if specified within double quotes. It is also interesting to know that DML (Data Manipulation language) operations such as INSERT,UPDATE,DELETE can be performed against these objects. Names must be specified within double quotes. 50) What is a database resource manager? Database resource manager allows us to create resource plans,which specify how much of our resources should go to various consumer groups.We can group users based on their resource requirement and we can have the database resource manager allocate a preset amount of resources to these groups.We can easily prioritize our users and jobs. 51) What are the uses of a database resource manager? 1) The database resource manager enables us to limit the length of time a user session can stay idle and to automatically terminate long-running SQL statements and user sessions. 3) By using the concept of active session pool,we can specify the maximum number of concurrent active sessions for a consumer group-the Database resource manager will automatically queue all the subsequent requests until the currently running sessions complete. Can we switch users between resource consumer groups/consumer groups? DBA’s can automatically switch users from one resource group to another ,based on preset resource usage criteria,and can limit the amount of undo space a resource group can use. 52) What are the four elements of a Database resource Manager? Database resource manager is composed of the following four elements : Resource consumer group, resource plan,resource allocation method,resource plan directive. 53) What is a resource consumer group? A resource consumer group is used to group together similar users based on their resource needs. 54) What is a resource plan? The resource plan lays o how resource consumer groups are allocated resources. Each resource plan contains a set of resource consumer groups that belong to this plan, together with instructions as to how resources are to be allocated among these groups. For instance,a resource plan may dictate CPU resources be allocated among three resource consumer groups so that the first group gets 60 percent and the remaining two groups get 20 percent each of the total CPU time. 55) What is a subplan? A subplan is a part of the resource plan that enables the allocation of resources in greater detailamong the resource consumer groups. 56) What is a resource allocation method? The resource allocation method dictates the specific method we choose to use to allocate resources like the CPU.The available methods of allocating the database resources are CPU method, Idle time, Execution time limit,Undo pool,Active session pool,automatic consumer group switching,cancelling SQL and terminating sessions,parallel degree limit. 57) What is a CPU method? Oracle uses multiple levels of CPU allocation to prioritize and allocate CPU usage among the competing user sessions.It is a type of resource allocation method. 58) What is an idle time? It is a type of resource allocation method.We can direct that a user’s session be terminated after it has been idle for a specified period of time.We can also specify that only idle sessions blocking other sessions be terminated. 59) What is an execution time limit? It is a type of resource allocation method.We can control resource usage by setting a limit on the maximum execution time of an operation. 60) What is an undo pool? It is a type of resource allocation method.By setting an undo pool directive,we can limit the total amount of undos that can be generated by a consumer resource group. 61) What is an active session pool? It is a type of resource allocation method. We can set a maximum allowable number of concurrent sessions within any consumer resource group.All sessions that are beyond the maximum limit are queued for execution after the freeing up of current active sessions. 62) What is an Automatic consumer group switching? It is a type of resource allocation method.Using this method,we can specify that a user session be automatically switched to a different group after it runs more than a specified number of seconds.The group that the session should switch to is called as switch group,and the time limit is the switch time.The session can revert to its original consumer group after e end of the top call,which is defined as an entire PL/SQL block or a separate SQL statement. 63) What is cancelling SQL and terminating sessions? It is a type of resource allocation method.By using CANCEL_SQL or KILL_SESSION as the switch group,we can direct a long-running SQL segment or even an entire session to be cancelled or terminated. 64) What is a Parallel Degree Limit? It is a type of resource allocation method.We can use this method to specify the limit of the degree of parallelism for an operation. 65) What is a resource plan directive? 66) How will you get details on SGA and PGA from v$ views? We can get to know the size of SGA (System Global Area) components and PGA (Program Global Area) components using sql query. We can query the v$ dynamic performance views to get more information about the memory structure of the oracle instance. 67) Why does desc index command does not work? I tried describing an index using the command DESC indexname. I got the following error. I wondered why this happened as I’ve already created an index with this name. So,I tried creating an index with this name. 68) What is a cursor? Why do I need it? If you are a oracle newbie developer, experienced oracle developer the first important concept in the code is going to be cursor. 69) What is real time use of a cursor? To put it simple, when we have a select statement output (set of ros usually more than one row) to be processed in a PL/SQL code, cursor usually comes into picture. 70) How do I start using a cursor? This makes the processing of set of records very simple, easy and efficient. 71) What jobs can be scheduled using scheduler in an oracle database? 72) You connect to the database and query v$pwfile_users. What does this mean? In oracle database we can create users and grant sysdba and sysoper privileges. It is interesting to know that when an user connects to the database with sysoper privilege, and when we query the user, PUBLIC is displayed. 73) Can we perform backup of tablespace when it is in readonly more? I made the tablespace read only and tried performing backup in a table in read only mode. Perform backup of tablespace and found that it worked fine without any issues. 74) What is Oracle Database Vault? Oracle Database Vault is a security solution from oracle corporation. It restricts access to certain areas of the database.Even users with administrative privileges have restricted access.This fine-grained access control protects the database from super-privileged users. 75) Where can we use Oracle Database Vault? What are the components of Oracle Database Vault? 76) What is Oracle Database Vault Access Control Components made of ? 77) What is a realm? A realm is a functional grouping of database schemas,objects and roles that must be secured.After grouping we can use realms to control the use of system privileges to specific accounts or roles. This provides fine-grained access control. 78) What is a command rule? A command rule is a special rule created to control how users can execute almost any SQL statement.This includes SELECT,ALTER SYSTEM,DDL and DML statements. 79) Do command rules work alone? No.They work with rule sets to determine whether or not a statement is allowed. 80) What is a factor? A factor is a named variable or a attribute such as user location,database IP address,or session user,which oracle database vault can recognize and secure. 81) What is the use of a factor? 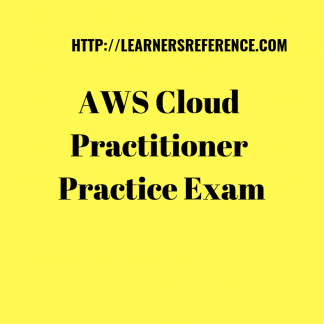 We can use factors for activities such as authorizing database accounts to connect to the database or creating filter logic to restrict the visibility and manageability of data. 82) What is an identity? 83) What is a rule set? A rule set is a collection of one or more rules that we can associate with a realm authorization, command rule, factor assignment, or secure application role. 84) What are the possible evaluations of a rule set? The rule set evaluates to true or false based on the evaluation of each rule it contains and the evaluation type (All True or Any True). 85) What is a rule within a rule set? The rule within a rule set is a PL/SQL expression that evaluates to true or false. 86) Can rules be reused? We can have the same rule in multiple rule sets. 87) What are secure application roles? A secure application role is a special Oracle Database role that can be enabled based on the evaluation of an Oracle Database Vault rule set. 88) What are the steps taken to secure database using Oracle database avult access control component? 1) Create a realm composed of the database schemas or database objects that we want to secure. 2) We can further secure the realm by creating rules, command rules, factors, identities, rule sets, and secure application roles. 3) We can run reports on the activities these components monitor and protect. 89) What is a Oracle database vault administrator(DVA)? Oracle Database Vault Administrator(DVA) is a Java application that is built on top of the Oracle Database Vault PL/SQL application programming interfaces (API). 90) What is the use of DVA? 1) DVA allows security managers who may not be proficient in PL/SQL to configure the access control policy through a user-friendly interface. 2) Oracle Database Vault Administrator provides an extensive collection of security-related reports that assist in understanding the baseline security configuration. 3) These reports help to point out deviations from this baseline. 91) What is Oracle Database Vault Configuration Assistant (DVCA)? It is a command-line utility that is used to perform maintenance tasks on Oracle Database Vault Installation. 92) What are the Oracle Database Vault schemas? The DVF schema contains public functions to retrieve (at run time) the factor values set in the Oracle Database Vault access control configuration. Oracle Database Vault PL/SQL Interfaces and Packages are collections that allow security managers,application developers to configure security policy.The PL/SQL procedures and functions allow general database accounts to operate within the boundaries of the access control policy in the context of a given database session. 96) How LogMiner Utility works? LogMiner reads the redo log files and puts the extracted contents into the v$LOGMNR_CONTENTS view.We can query the v$LOGMNR_CONTENTS view to obtain information about the transaction we’d be interested in.The information in redo logs is in the form of internal object identifier and data is in hexadecimal form. Oracle recommends that we provide logMiner with access to the data dictionary so it can translate the contents of the reolog file into a form we can readily understand. 97) What are the database objects supported in latest version of Oracle database? Index-Organized (IOT) Table – Index-Organized (IOT) Table is a table whose physical storage is organized like an index.IOT stores data according to the primary key defined on tha table (sorted order). 98) What parameters are needed for dynamic service registration/automatic service registration? 99) What if we don’t specify the value of SERVICE_NAMES? 100) What is a global database name? A global database name is a combination of DB_NAME and DB_DOMAIN parameters. 1) What are the many different types of blockchain? 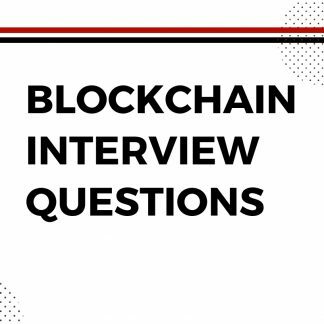 2) Is blockchain a transactional database?